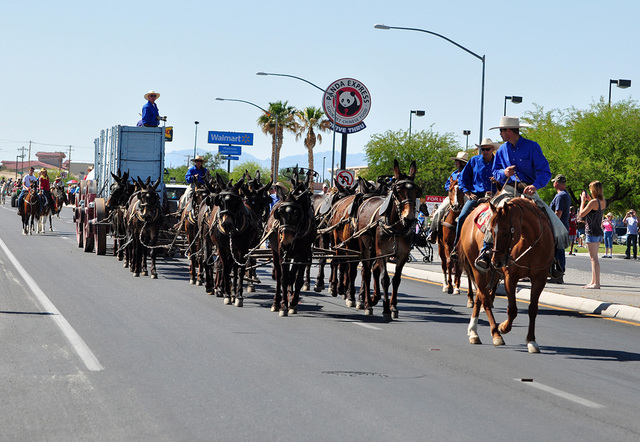 A Pahrump western-themed tradition returns to town starting today and runs through Sunday. The annual Wild West Extravaganza and Bluegrass Festival brings back food, fun and entertainment to Petrack Park, beginning at noon. Vendors’ booths open on Saturday and Sunday at 8 a.m. The tradition was started by the late Bob Baker more than a decade ago with musical performances, trail rides, games and more. Parade Chair Janice Maurizio said more than 30 vendors have signed on to participate, including a big selection of food vendors. Entertainment will be constant throughout the three-day event. Maurizio said this year the extravaganza will have a group from Southern California for the first time. Additionally, Maurizio said the entire gang can get itchy ‘trigger happy’ at any given time throughout the weekend. Kicking off Saturday’s events will be the popular parade portion of the extravaganza, which starts at 9:30 a.m. Though there’s more than 20 entrants so far, Maurizio said it’s possible to take on additional entrants by Friday. Visitors can look forward to numerous activities and entertainment. One of the more popular events are the outhouse races. The 4-H Club will set up a ‘Hay Dig’ for children to frolic in. Other forms of entertainment will be the ‘Crazy Legs’ competition. One caveat Maurizio noted is that Highway 160 will be temporarily closed to traffic during the parade. For additional information call 775 209-6731 or 714 323-5348.